A Graduate in Electronics & Communication Engineering, would be equipped with fundamentals of Electronics and communication as well as a strong mathematical aptitude. He/She would be able solve complex challenges in Electronics and Telecommunication Engineering, and thus would be adequately prepared for a career in research, design, manufacture, and maintenance in the fields of consumer electronics, electronic media, Bio-Medical, Automobile-control, communication, software, Computer hardware, and other electronic fields. Passed in 2nd PUC/ 12th Std./ Equivalent Exam with English as one of the Languages and obtained a minimum of 45% of marks in aggregate in Physics and Mathematics along with Chemistry / Biotechnology / Biology / Electronics/ Computers (40% for reserved category candidates). 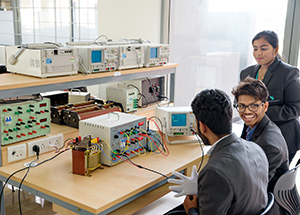 The main objective of this laboratory is to create interest in students to make them learn fundamentals of Electronics through hands on training to build electronics circuits. This laboratory is equipped with CRO and Digital Storage Oscilloscopes, Large Bandwidth Signal Generators, high quality components like Aurdino boards, Raspbury PI, power supplies etc. 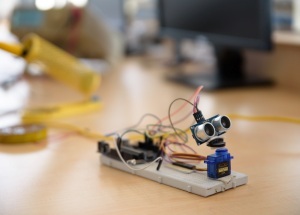 Students are trained to develop MARS Rover applications using Aurdino development board. 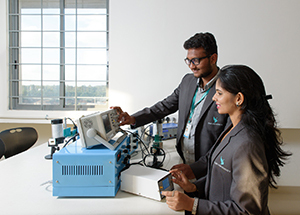 The laboratory has state-of-the-art electronic equipment like Digital Storage Oscilloscopes, Large Bandwidth Signal Generators, measuring instruments, workbenches and components. Students are trained in designing and assembling Analog electronic circuits for real life applications. High quality Integrated Circuit (IC) Trainer kits and IC chips are available here. 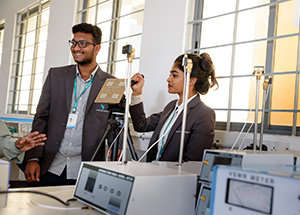 The students are trained to design, build by interconnecting the components and test the Digital Electronic Circuits for the given specification. This laboratory also houses high-end computer systems and high-quality HDL Trainer Kits. Here the students are trained in developing programs for HDL applicationsand designing complex digital circuits using industry-level FPGA boards. Also, the students are taught VERILOG and VHDL programming. The laboratory is equipped with Digital Storage Oscilloscopes, Large Bandwidth Signal Generators, high precision workbenches, measuring instruments and components. This lab focuses on training the students on Linear circuit design using Operational amplifier,various applications of 555 timer and other Linear Integrated Circuit components. The laboratory has extensive facilities for the use of 8/16 bit microprocessors/microcontrollers and their interfacing for different applications, using hardware and software concepts to meet industry standards. 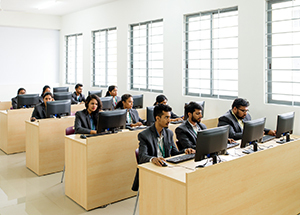 This laboratory houses high end computer systems and high quality PIC and 8051 trainer boards to train the students in microcontroller and microprocessor based application development. The laboratory plays a vital role inteaching various signal processing techniques and algorithms. Students are encouraged to develop algorithms and implement them in both MATLAB and DSP processors. The lab has multiuser MATLAB software and high quality DSP trainer kits, which are used to train the students in using this powerful toolto develop applications to engineering problems. In addition to the above, this laboratory also facilitates students to implement minor and major projects in the area of signal processing. The laboratory is equipped with Power Scope, Auto and Isolation transformers, high quality Induction motors and various power electronics modules. The laboratory course teach general lab practices, measurement methods, and operation of several circuits relevant to the field of power electronics. It also provides hands on experience with selection and usage of common components such as motors, batteries, magnetic devices, and power semiconductors. The main objective of this laboratory is to train the students in various aspects of antenna design for effective and reliable communication,use microwave workbench to calculate various microwave parameters and to understand waveguide transmission concepts. The lab is equipped with high quality antennas such as microstrip antennas, horn antenna, reflectors, Yagi-uda antenna etc., RF transmitter and power meters. The laboratory hasstate-of-the-art electronic equipments including Industry-standard high frequency Digital Oscilloscopes and Signal Generators. Students are provided the relevant information on the basic concepts of processes, circuits and other building blocks of experiments related to analog and digital communication. Here the concepts and techniques used in circuit design, microwave communication and optical communication are taught and also various methods and techniques of conducting the experiment are highlighted. 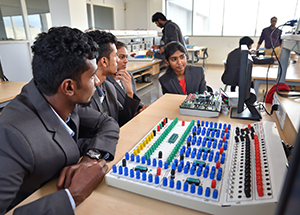 This laboratory is used to train the students in various applications of Embedded systems using hardware and software concepts to meet industry expectations. 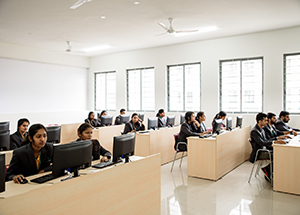 This laboratory houses high performance computer systems and advanced ARM Cortex M3 and 8051 boards to train the students in Embedded applications.